The ultimate symbol of romance, roses are cemented in the world of perfume, but did you know that they have a surprising number of skincare benefits too? Known mostly for their anti-inflammatory and antioxidant qualities, roses are universally favoured as just about any skin type can use them. A natural choice for treating acne and acne-prone skin, rose has amazing cleansing properties, making it an ideal ingredient for cleansers and shower gels. The Nuxe Comforting Cleansing Milk (R260.00), for example, marries the cleansing properties of rose with its soothing abilities to create a cleanser that’s nourishing and suitable for dry and sensitive skins. Not only is it a lovely fragrant ingredient for body washes, but it makes for effective yet gentle cleansing, so that the skin is left soft and hydrated rather than tight and dry after a shower. The Lush Rose Jam Shower Gel (R195.00) and Earthsap Body Wash in Wild Rose and Vanilla (R80.00) harness the natural powers of rose to cleanse and restore. These are great options if you’re wanting to go a more natural route and avoid added artificial ingredients. Rose oil is a powerful anti-inflammatory agent and can assist in reducing redness and swollen spots on the skin. Its calming properties make it a popular ingredient in toners. 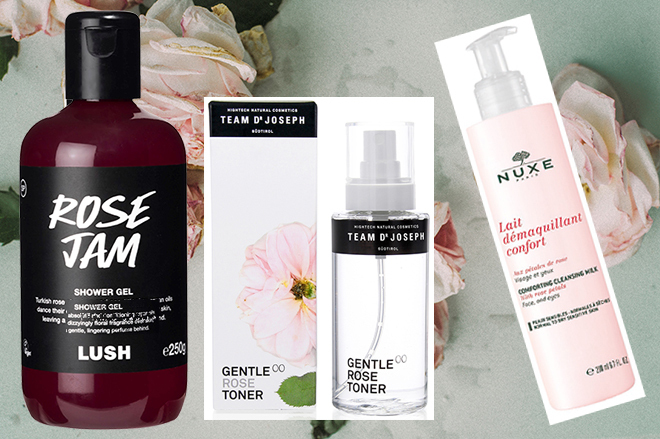 We’ve tried the Team Dr Joseph Gentle Rose Toner (R365.00) and found it had a soothing and calming effect on the skin – just what you need when are dealing with sensitivity and discomfort. The natural oils present in roses help to lock moisture into the skin and keep it soft and hydrated. 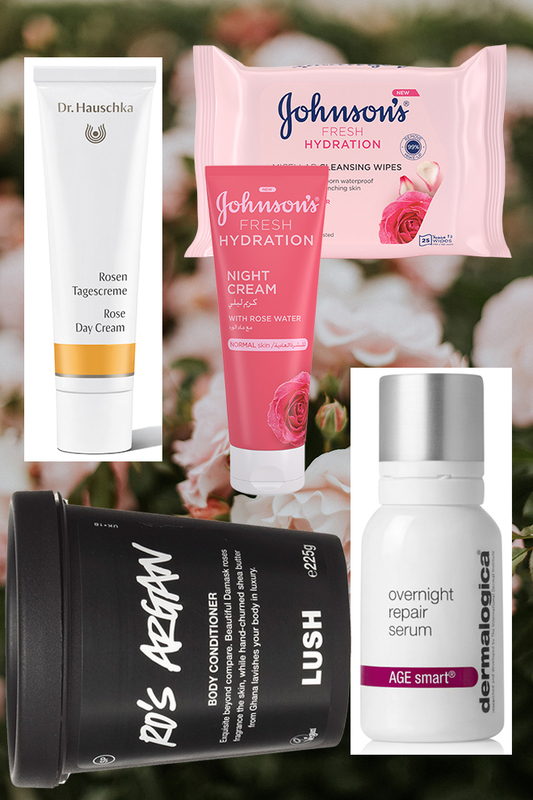 It comes as no surprise then that skincare brands across all price brackets use roses in their formulations. Dermalogica Overnight Repair Serum (R1029.00) is a powerful peptide serum that stimulates cellular repair while you sleep. It stimulates collagen production, firms and renews the skin and increases luminosity. The added rose oil revitalises lackluster skin and smoothes away fine lines. A somewhat cult favourite, Dr Hauschka’s Rose Day Cream (R595.00) contains precious extracts of rose petals and wild rose hips to nurture and balance the skin. It also calms the skin and minimises sensitivity. Plus, it doesn’t hurt that the fragrance is phenomenal! Looking for an affordable option? The Johnson’s Fresh Hydration range offers optimum hydration combined with a stunning scent and refreshing feel. Sumptuous and luxurious, the ultimate rose body lotion has to be Lush Ro’s Argan Body Conditioner (R295.00). It’s like an explosion of roses as soon as you open the container (the Damask rose petals used are picked at dawn in Senir, Turkey, when their scent blooms strongest. The rose absolute and oil obtained from these petals soothes and calms the skin. We find the scent totally enthralling and the effects on the skin even better! Popularly used in aromatherapy, rose is known to calm and soothe the mind. After a long day, we recommend a bathtub (if you’re not in a water-restricted area!) filled with TheraNaka Desert Rose Illuminating Bath Salts (R180.00). The sensual rose fragrance helps prepare the body for sleep, so it’s a great product to add to your night-time routine. Rose Geranium Essential Oil is great to use in a burner or diffuser for therapeutic purposes. It assists with balancing hormones and is especially good for PMS, uplifting the mood and easing symptoms of menopause. You can also mix a few drops with a carrier oil like jojoba or your face cream to reap the rosy benefits. 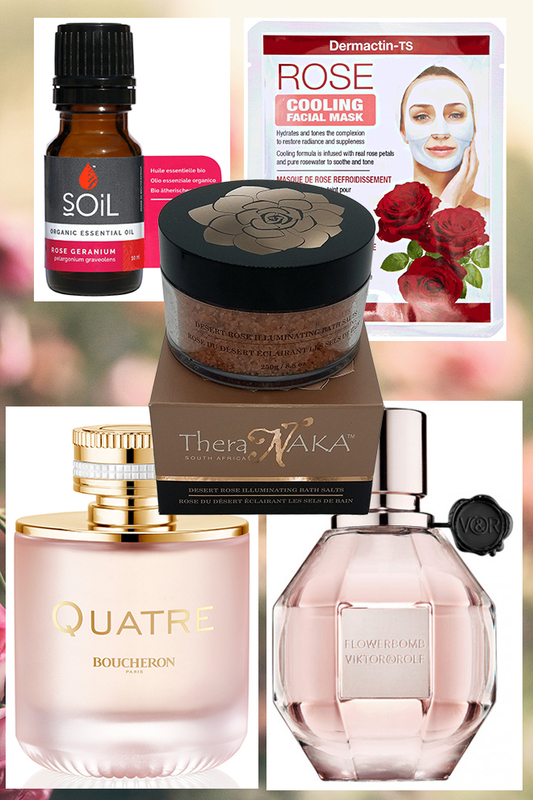 We love the SOiL Rose Geranium Oil (R120.00). Throw a face mask like the Dermactin-TS ROSE Cooling Facial Mask (R44.95) into the mix and you’re in for a major TLC session. Despite knowing that there’s so much more to this beautiful ingredient, there is no escaping its captivating scent. Every floral fragrance lover knows that rose is the ultimate fragrance note. We highly recommend Boucheron Quatre en Rose (R1310.00) and Viktor & Rolf Flowerbomb (R1600.00) to carry the timeless rose scent with you wherever you go. Do you have a favourite rose product? Tell us in the comment section below.